Do bloggers make money blogging? Like, Really? A s a newbie blogger or someone considering to become one, it is possible you have many questions, especially about making money blogging. For example, you must be wondering, how much money can you make blogging? Do bloggers make money? Can blogging be a source of fulltime income? According to Worldometers, WordPress bloggers publish 1.3 billion blog posts daily. This number is higher because WordPress is just one of the most common blogging platform with a market share of approximately 60%. Why would bloggers publish so many posts daily if none of them makes money? Do bloggers make money? Yes, you can earn a full-time income from blogging, but how much money can you make blogging depends on many factors, such as starting and building a blogging business and not a hobby. Thus, this post aims to show you how successful bloggers make money, why others do not make any and give you some tips, tricks, and strategies you can use to make some. Subscribe to get the ultimate step by step guide to building your own blog today even in you are a complete beginner. You do not need any prior experience or technical coding skills at all! How much money can you make blogging? And do bloggers make money? Blogging is just like any other business out there where there is the poor, low class, middle class, millionaires and billionaires with different income status. Similarly, some bloggers earn $0, others below $1000, others above $10000 and a few lucky ones above $ 50,000. Let’s use a few examples of 5 bloggers I follow to get a rough estimate of how much money can you make blogging. Follow this link to find all income reports for millennial money man blog. Selling digital products, such as courses. This is one of my favorite bloggers because everything I learned as a new blogger while I was starting out I got from their blog and YouTube channel. Visit this link to find a full breakdown of Alex and Lauren income sources. These five are just a few examples of bloggers out there who have turned their blogging businesses into careers and fulltime income sources. For a blog to make money, you must monetize it using different strategies and income sources. In case you are still wondering how much money can you make blogging, it depends on how well you use the six strategies below and many others to monetize your blog. This is where you recommend other brands products to your blog readers, and you will get a commission/a certain percentage of the sale every time one of your audience makes a purchase using your affiliate link. You can click on any of the image (s) below to get a detailed explanation of this method of making money blogging. Click on any of the images below to get a detailed explanation of this method of making money blogging. This is where you create your products, such as eBooks, courses, software, and themes among others, and sell them to your readers. As a blogger you are already an expert at something, so you can offer coaching, consulting, freelancing, virtual assistance, personal training and other forms of services to interested audiences. Since you have a marketing platform-your blog, you can use it to sell other products by adding a shopping cart function to it. For example, a fashion blogger can easily sell trending products from famous stores, such as Amazon and eBay from their blog. Some bloggers create high-value content and sell it to their readers. For example, you can create a bloggers club, job board for freelance bloggers or a paid membership forum with highly valuable content. How much time will it take to start making money blogging? For some, it takes shorter time while for others it takes longer because it depends on these five factors and many more. Yes, you can make money blogging in any niche, but the truth is some niches are more profitable than others. For example, fitness, make money online, and relationship niches are more profitable than other rare niches, such as herbs. There is no wrong or right niche, but you should know that the more audience or popularity a niche market has, the higher the chances of making money blogging fast. Also, how much money can you make blogging also depends on where a niche has high conversions, monetization options, and active audience. Suggested reading: 3 quick hacks for finding a profitable niche and seven most profitable blog niches with good money and traffic. By traffic I mean your blog must have visitors/readers to make money blogging. The higher the traffic or page views, the higher the possibility of making money online. Caution: You can have high traffic but not still make money blogging because it also depends on factor c and e below. Have you monetized your blog well? And, do your readers trust you? Most bloggers-me included, confess that Pinterest is their primary source of traffic. Apart from Pinterest, other social media platforms, Google, paid advertising, forum marketing, and influencer outreach are also other strategies you can use to promote your blog and drive traffic to it. Visit this post on promotion methods you can use to drive traffic to your blog to learn more. Some monetization methods are more profitable than others. For example, selling your digital product is more useful than using advertising. Also, using multiple monetization strategies is more profitable than relying on one alone. Therefore, home much money can you make blogging depends on how well you shall monetize your blog. Tip: Visit similar blogs in your niche and find out the best strategies they use and borrow from them. Also, reach out to individual bloggers or join social media communities for bloggers, such as Facebook groups, to learn more. Suggested reading: How to monetize a blog and make money online. Most people assume that blogging is simple and just for jokers. Such a blogging focus will never make you a full-time income online. Bloggers who make money treat their blogs like any other business. For example, they perform SEO, social media marketing, create excellent and detailed blog posts among other serious endeavors. Therefore, Building a successful blogging business takes starting one from scratch the right way and building it with the right blueprint. You can also check out this build your website guide for more information. Here comes the real deal now. I know you know that customers only buy from people they trust, right? Your blog must build a community of fans and engaged readers before you can make money from it. How much money can you make blogging largely depends on whether your audience sees you as an authority, professional and trustworthy person. There are many strategies you can use to build customer trust and high engagement, such as replying to their comments and email marketing among others as explained in this post: 15 strategies you can use to build customer trust and engagement. Are you investing/spending money on the right blogging tools, resources, and networks? For example, have you invested in the right theme, web hosting, social media management tools, web designer among other resources? In summary, whether you shall earn money blogging will depend on the decisions you make about what to allow and what to let go of your blog. In summary, if you build a blog the right way and perform all tips and tricks correctly, after six months, you should be making some money. However, do not forget that this is not a general rule because traffic of new blogs keeps fluctuating. Thus, give yourself at least one year or less before you transform your blog into a full time income business. 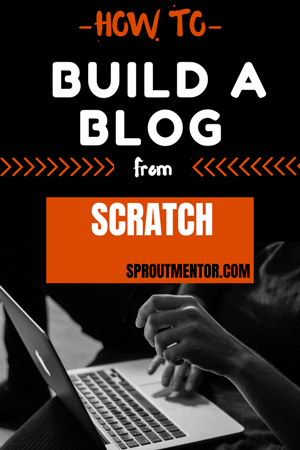 Making thousands, millions or even billions blogging will never be an overnight success. It takes handwork, persistence, and consistency to build a fulltime income from a blog. There is no perfect time to monetize a blog-the earlier the better. In fact, monetize it from day one with affiliate links or any other method. In the first one year or more your blogging income will not be stable-sometimes it will go high or low as your traffic keeps fluctuating. Thus, it takes some time to build a stable income from a blog. You must be valuable/useful to make money blogging. Become a problem solver, and your readers will buy from you. Making money blogging is all about having high site traffic from the right target audience who fit your niche, unique selling proposition, content and business model. Every successful blogger will tell you that an email list is the most powerful tool you can use to make money online. “If you don’t have a list, you don’t have a business” Tony Robins. Use multiple monetization stream/sources to build an income base faster. Suggested reading: 18 bloggers reveal top facts about making money blogging. What should you focus on as a new blogger? Now that we are clear on these three important facts: a) bloggers make money, b) the amount of money you make depends on several factors and c) making money from a blog is not an overnight success story; I can finally tell you the truth. Blogging is a gateway or bridge that will bring the right buyers to you. Therefore, as a new blogger, your main focus should not be “how much money can you make blogging,” instead put more emphasis on creating content/products which will attract buyers to your site. Bitter truth: No one will ever want to buy from you if you are not giving any value in exchange. Most importantly, they will never stick around long enough to allow you to transform them from visitors into buyers, subscribers, and your brand ambassadors if they get disappointed from the first encounter in your blog. Note: Of course you should monetize your blog at all times, what I am trying to tell you is stop stressing over why you are not making millions at the beginning and begin to measure if you are building an engaged audience or not. Choose your focus: Your blogging journey can be dull, lonely and discouraging at the beginning-every blogger starts there-the difference between those who give up and others who persevere till the riches come is one-having the right focus: money or your audience. Wise and successful bloggers know that when they focus on building trust, listening, engaging and offering quality to their target audience, the money will eventually come in bulk. H ow much money can you make blogging? A tough, yet exciting question, right? I hope you have found the perfect answer in this post. In summary, the answer is simple; the amount of money you will make out of your blog depends on several factors, such as niche, traffic, monetization strategy and audience trust/engagement among others. This explains why some bloggers make extremely more than others at the end of the day. The simple rule is to stop comparing yourself and start building an audience and driving traffic to your blog by creating great content/products and promoting your blog widely. As straightforward as this, if want to make one million from your blog, then get active and build a community of 1 million engaged readers. How? Simple be valuable, useful, consistent and solve their problems. Feel free to leave a comment below asking a question or even better provide a suggestion of a post you would like me to write about. Did you like the post? Kindly pin it or share it. My name is Hildah Mwende. I am a freelance writer and a coach. My expertise falls in the following subject areas, but it is not limited to them: WordPress, Search Engine Optimization and Social Media Marketing. Find a comprehensive list and description of all my competencies and specialties here. You Have Subscribed Successfully. Check your Email to confirm Subscription. Great read! I haven’t made any money yet, but I’ve had a few sponsored press trips and hotel stays! Working on getting my page views up to start making some actual CASH though! Very true! It starts with having a sizeful amount of traffic and pageviews before killing the CASH! Am happy your are putting several money-making foundations earlier. Wish you luck girl! This is encouraging! I am purely blogging for the love of sharing and helping others but if I can turn it into profit, hey, win win!! Thanks for the information, very useful. Very true-you do what you love and also get some profit returns out of it-killing two birds with one stone. I am glad I helped. Feel free to reach out for any help. Blogging can be so tricky but it can have a huge pay off. This is some great information! Thanks. I am happy that you agree with me that blogging pays off in the longrun. Thank you for loving the post, kindly share it.